National Young Farmers Coalition | Seeking Farm Hack blog contributors! Seeking Farm Hack blog contributors! Have you ever built or retrofitted a tool or machine for your farm? Are you interested in on-farm innovation? Help share these stories with the young farmer community! 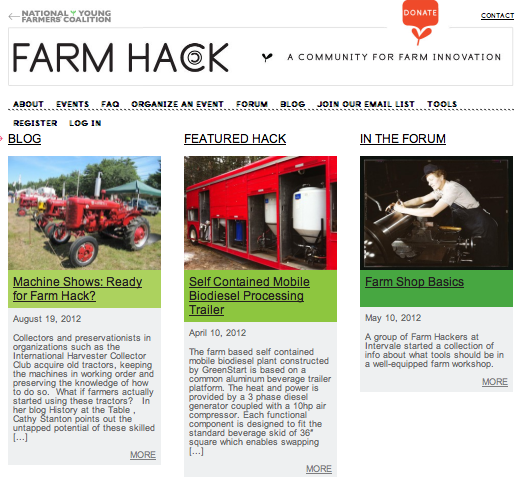 Farm Hack, a project of NYFC in partnership with the Greenhorns is seeking contributing writers for the Farm Hack blog. Farm Hack is a farmer-driven community to develop, document and build tools for resilient agriculture. We do this through in-person events and through our website. The blog serves to share news of interest to our Farm Hack community, whether it’s a new tool we have developed, a great blog or website resource, or an upcoming event – the options are pretty endless. You can submit a post just once, or contribute monthly – its up to you. Whether you are an enterprising farmer, tinkerer or just interested in researching and writing about on-farm innovation relevant to young farmers, we would love to have you join the team! Contact Kristin at events@farmhack.net for more information or to submit.